Looking north from a fair weather anchorage tucked in behind the Limestone Islands (map link) on the east shore of Louise Island . 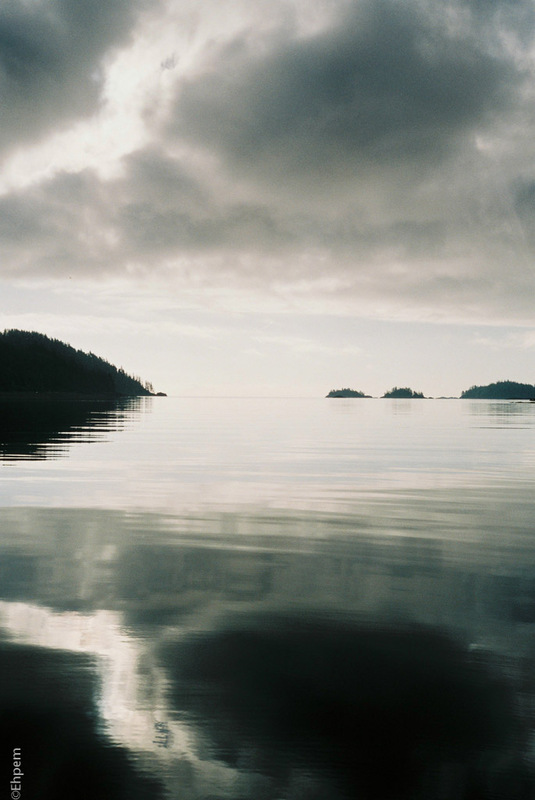 This location is just north of Gwaii Haanas near the village of K’uuna Llnagaay (Skedans), photographed from the Passing Cloud. Thanks ishanlin, and welcome to my blog, sorry for the delay in responding, lots of busy things going on in my life at the moment. Not all that peaceful when it comes down to it. Thank you elizabettina – these morning views from the deck in quiet anchorages are endlessly captivating. I have a lot of photos like this one, though for some reason most of the best are on film, not digital. Love this watery, light-filled look. You can just empty yourself into it! Thank you Lynn – that is pretty much what happens to me when I spend a couple of weeks in this area. I do empty myself into the surroundings, especially the light, and the early mornings before the night’s peace has been disturbed.